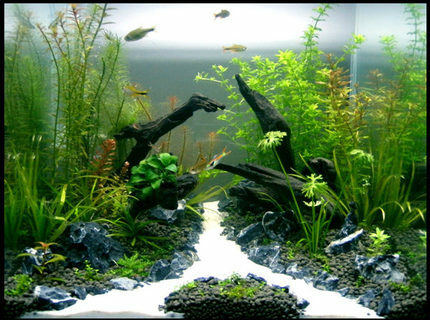 Fish Kept: Rummy nose, cardinal tetra, ottocinclus, shrimps, siamensis fox. Advice: Ask me for help! Fish Kept: Lots lol. Message me or email me to find out more. Advice: Join forums, read and ask questions. 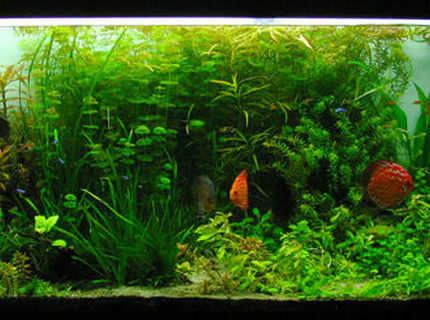 Corals/Plants: Limnophila aquatica, Limnophila sessilifolia, Hygrophila difformis, Hygrophila angustifolia, Hygrophila polysperma, Hygrophila polysperma var. 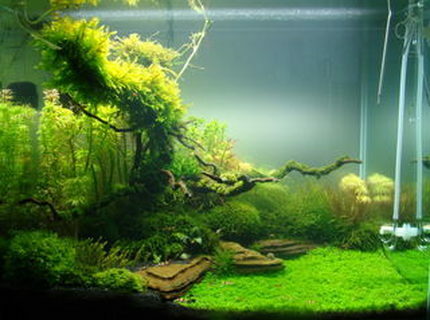 green, Hygrophila salicifolia, Rotala rotundifolia, Rotala macandra, Rotala indica, Java fern, Java﻿ fern windelov, Java moss, Nesaea crassicaulis, Anubias Nana, Anubias nana var. 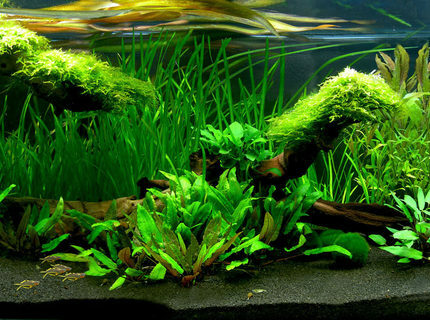 petit, Anubias barteri,Amazon swords, Ozelot sword, Red lotus, Lily, Micranthemum umbrosum, Dwarf sag, HC, Hemianthus micranthemoides, Bacopa australis, Bacopa monnieri, Lobelia cardinalis, Ludwigia repens broadleaf, Different crypts, Vallisneria﻿ spiralis and others that I am sure I am forgetting. Quote: For every bad day in life you get a good one, and Vice Verse. 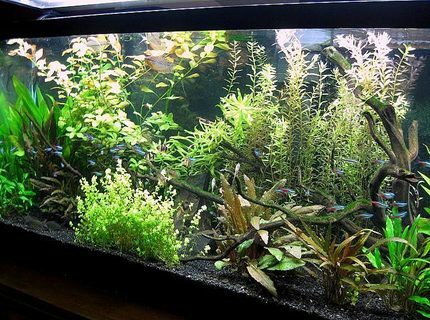 About Yourself: Just been started fish keeping 8 months ago.. and start to do plant keeping 3 months ago.. Relax after long day at work.. been keeping discus and shrimps only recently.. Advice: Ask Questions.. Search google for inspiration.. Create your own imagination.. Dont be scared cause you can always change it..
Quote: If it can't be solved by talking to a fish, it can't be solved. About Yourself: I live in Southern California and am a psychotherapist. My interests include golf, poker, my 2 dogs and 2 cats, and now my fish. I don't remember why I got my first Betta about 4 years ago, but that got me hooked on having at least one Betta nearby. 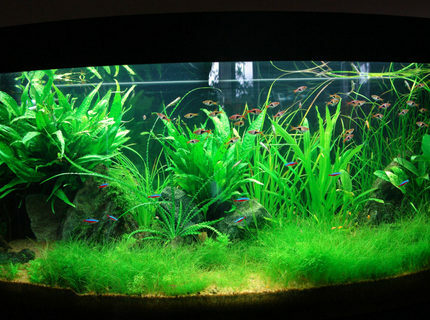 In recently learning that keeping Bettas in vases is actually cruel, I was exposed to the fish/aquarium hobby, fell in love with it, and got a real tank. Now I can't keep my arm out of it or my eyes off it. 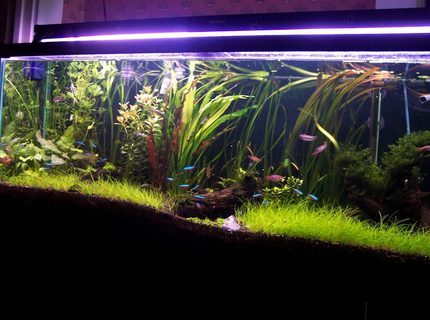 Advice: Start slowly, buy the biggest tank you can properly support (weight/dimension wise) in your home, thoroughly research the fish's wants/needs before you buy them, and consider fishless cycling as a humane option. Don't keep bettas in bowls and do keep schooling fish in *schools*. 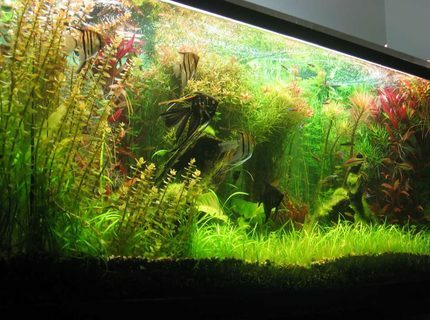 Description: This is my 55 gallon tank with live plants. 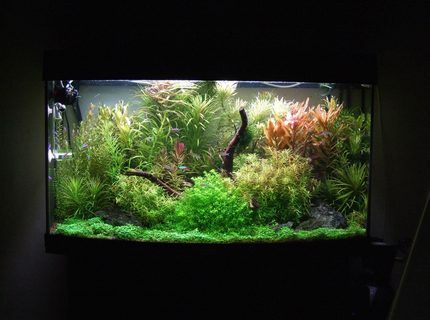 It has been up since March with plants being added slowly since then. For decor I used driftwood and large black rocks. Filtration is an Aqueon 55 HOB and an extra Penguin 150 HOB. I keep the temp at 78 degrees. The lighting is Coralife CF at 5wpg on 6 hours per day. I use pressurized CO2. 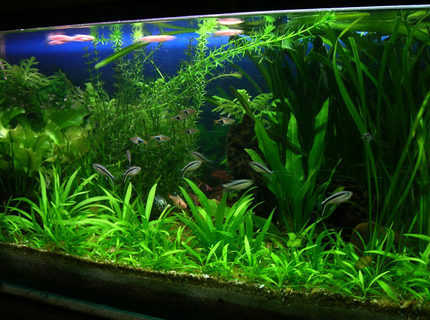 For livestock I have 1 angelfish, 3 pearl gourami, 7 tiger barbs (no, they don't bother anyone), a large school of neon tetras, 4 emerald green corycats, 2 yo-yo loaches, 7 amano shrimp, 7 otocinclus. Be gentle, I'm new at this!